If you’ve ever played a food service game (see: Diner Dash), you’ll be fine with playing Crazy for Food. It has most of the usual trappings: a customer sits down, demands food, you serve him/her whatever they want, and then clear the dishes. If you make the customer wait too long, he/she will become angry and leave, denying you the money/points you need to reach your daily goal. In Crazy for Food, a day ends when the doughnut at the top–which starts out on the “Open” sign–reaches the “Closed” sign. The food comes out on three lines of conveyor belts (sushi-style), all of which move at different speeds. Tap the plate the customer wants to serve them with it, but one thing you have to remember is that the plate has to be in front of the customer in order to get it to them. Otherwise you’ll be wasting food, prolonging their wait, and losing points. Tap the empty dish to clear it before serving the customer again. Crazy for Food has 100 levels, 26 kinds of food, and 12 different characters (both animal and human), so you’ll have plenty to occupy yourself with. I admit, it took me a couple of tries (and a good amount of points) before I realized that the food needed to be right in front of the customer in order to serve it; that aspect constricts your options a good deal and makes the game a bit more challenging. Other than that, Crazy for Food brings little that is new to the food service/time management table. 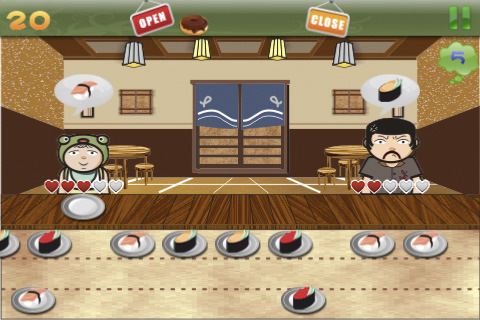 The graphics and designs are cute–the restaurant interiors are especially well-done–but the soundtrack is forgettable. One minor annoyance were the “I’m Hungry” speech bubbles that would appear whenever the customer was getting impatient. For one, I can already tell by your Heart Meter and your frowny face, thank you very much. For another, it completely obscures the picture of what is to be served, and if I can’t see it, I can’t serve it. You’ll probably want to spend your $1.99 elsewhere, but Crazy for Food does have over 100 levels to be played. AppSafari review of Crazy For Food was written by Julie Guan on July 2nd, 2010 and categorized under App Store, Fun, Games, Time Management. Page viewed 4070 times, 1 so far today. Need help on using these apps? Please read the Help Page.